I had always been a sunscreen girl. Be it a rainy day, cloudy day, cold day or sunny day, I can’t step out of my house without my daily dose of SPF. But no matter how strong a sunscreen fanatic I am, I do get confused about the best sunscreen to use. Summers in India can be really bad, finding the right sunscreen, the one you can easily wear daily, therefore, becomes critical. However, there is a problem with using sunscreens in India. While, sunscreens are generally heavy, greasy and thick formulas, Indian skin is typically oily, combination, and irritable, especially during the summer months. It took me a lot of experimentation before settling down with my old preferred brand: Lakme! After facing problems with L’oreal UV Perfect SPF 50, I switched to Lotus Herbals Daily Multi-function Sunblock, SPF 70. I had read great reviews about lotus sunscreens and the said product really turned out to be good. I returned from a week long vacation without even a mild tan is a testimony to the product’s effectiveness. But despite its effectiveness, the product turned out be a nuisance in summer months. It made my skin feel sweaty and hot, every time I applied it. It was only when my face greeted me with a new pimple every morning, I realized a fine wrinkle is a better than ugly pimples. My skin cleared up within a week, after I stopped using it. When I finally gave up on sunscreens and had gone to buy calamine lotion instead, my eyes fell on this small sleek tube from Lakme. The tiny 15 ml tube for 99 bucks seemed attractive for experimentation. I decided to give it a try. Although, the texture is of a thick cream, it feels quite light on the skin. The product says its for normal to dry skin but my oily and combination skin felt light and fresh even after hours of applying this product. It perfectly blended into my skin and despite being white in color it didn’t leave any white cast behind. My skin does look bright after applying, but it is like natural glow. The mild cucumber fragrance gives a fresh feel to the skin. Being one of the well researched products from Lakme, offering both UVA and UVB protection with an SPF of 50, it is ideal sunscreen for Indian summers and Indian skin. I am using this sunscreen religiously from last one month and have not experienced any break-outs so far. Overall, its a great one from Lakme. 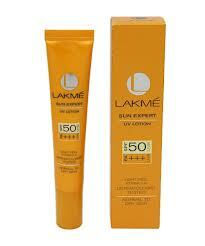 I have personally loved this sunscreen from Lakme after giving up hope on all sunscreens and sunblocks. Hats off to Lakme for putting brains into producing a sunscreen that would not just do its job well but will also suit most Indian skin types. I highly recommend this sunscreen to all girls looking for a right sunscreen for their skin type. Whether, you have dry, normal or combination skin, this is the best sunscreen to use for Indian summers.